This year the reviews are also available in print (see http://stores.lulu.com/lifeworth). Story follows below. 14th February, 2008, Lifeworth, Geneva, Switzerland. A wave of corporate announcements of environmental targets swept the world during 2007, says a review of the year published by a corporate responsibility consultancy. Awareness of climate change drove this agenda, with many companies announcing specific targets as part of their membership of initiatives like The Climate Group, the Carbon Disclosure Project, or the WWF Climate Savers initiative. Reckitt Benckister, Cisco and Proctor and Gamble are praised in the review for adopting broader targets. “Continuous improvement is no longer enough, with time-bound targets now in vogue for corporate responsibility” says report co-author Jem Bendell, a Director of Lifeworth, which publishes the annual reviews. “Targets express an awareness of the scale and urgency of an issue and a willingness to engage it. Although investing in new management processes are key, making a commitment to a performance target helps add the substance,” he added. This, the seventh annual review, reports on a survey of corporate responsibility professionals which suggests progress is occuring, but not fast enough to meet the international community’s goals on either climate change or world poverty. The poll of Lifeworth’s 4000 newsletter subscribers found they thought that by about 2028 approximately 57% of global economic activity would be environmentally sustainable. If that rate continues then overall performance would be 78% by 2050. This means the corporate responsibility community, as represented by Lifeworth’s subscribers, think current rates of progress would create a sustainable economy by around 2070. The Intergovernmental Panel on Climate Change (IPCC) has stated the world needs to see over 50% reductions by 2050, and the latest science suggests an 80% cut by then to remain under a critical threshold of 2 degrees warming. That would mean at least a 20% reduction in the next 10 years, and given growing emissions from industrialization in the global South, possibly even double that reduction in industrialized countries to offset it. The review argues that a slower rate of change appears to be futile, and so achieving a sustainable economy by 2070 will not actually be possible. The world community has also made a commitment to eliminate world poverty by 2025. To do so would require economic activity to be socially responsible. 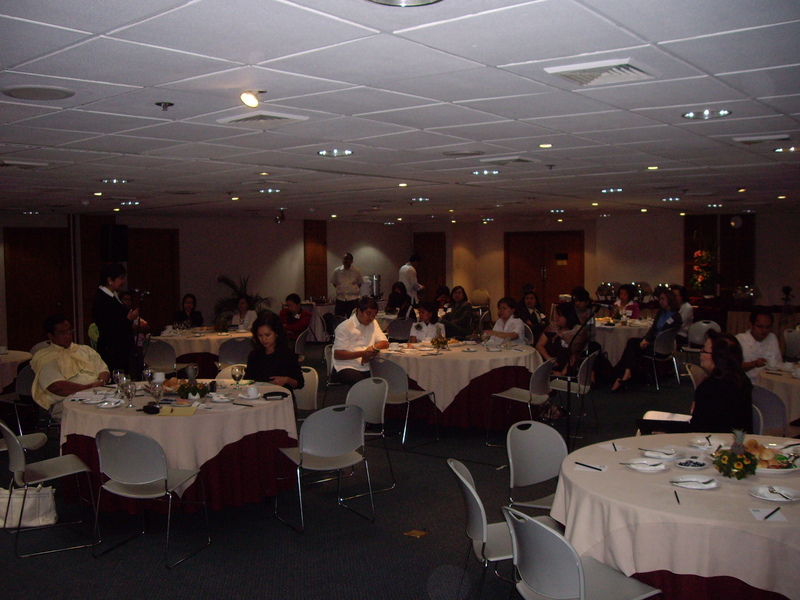 Professionals estimate that on current trends only about 50% of economic activity will be socially responsible by then. It will only be about 75% by 2050. “The message from the Lifeworth Annual Review is that although CSR efforts are delivering some progress, it may not deliver the sustainable global economy in time and we need to explore ways of enabling faster and deeper change,” explained Professor Michael Powell, Dean of Griffith Business School, which supports the publication. “A global step change in progress towards a sustainable world economy is required, and this will involve more targets from companies on their social and environmental performance, as well as more collaboration on how to shift entire sectors and market systems so they reward firms in meeting those targets” explained Dr. Bendell. * More networks and partnerships between companies and their stakeholders will focus on how to shape the market drivers that reward meeting such targets, including public policy, financial systems and consumer awareness. 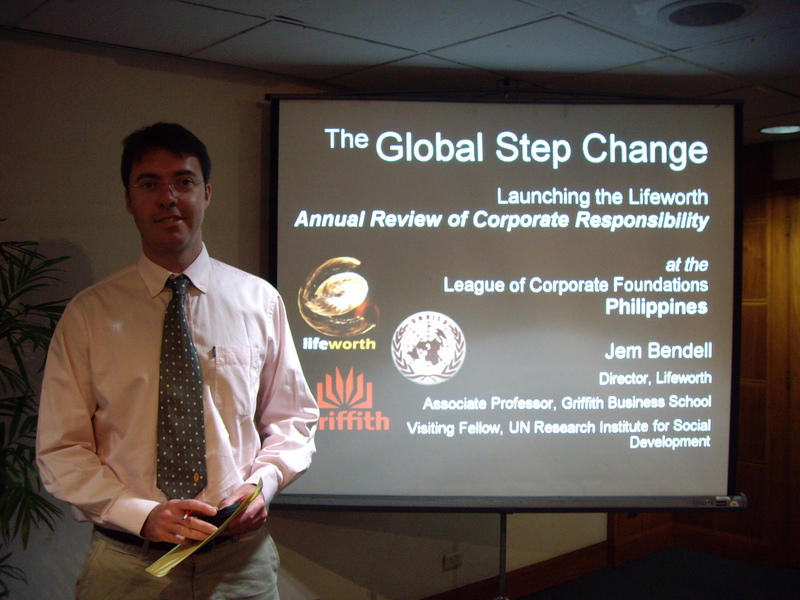 The review is launched by Jem Bendell, at the League of Corporate Foundations in Manila, Philippines, on February 14th 2008, and by the co-sponsor Professor David Grayson, in a series of lectures and speeches from February 13th to 15th in Brussels and in Copenhagen, at the Belgium Business and Society Conference and the Copenhagen Business School.